Psychologists feel that one of the biggest hurdles to acheiving dreams is a little four letter word: FEAR. According to Dr. Susan Jeffers, author of Feel the Fear and Do It Anyway, “The only way to get rid of the fear of doing something is to go out and do it.” (Jeffers 2007, 15) Furthermore, this fear could really be a good thing because, according to Dr. Jeffers, it’s a sign that you’re continuing to grow. I like to picture Esther as she walks out of the women’s area into the king’s presence. At some point, she must have turned a corner and realized, perhaps trembling, that there was no turning back. She’s dressed in her royal robe, her queenly attire, and when Ahasuerus sees her standing in the court, he addresses her as Queen Esther. Queen Esther, not just plain old Esther. She’s put thought into her appearance, and her attention to detail does not go unnoticed by the king. He seems pleased to see her, extends his scepter, and asks for her request. This fear talk makes me think of my daughter Carrie and how courageous she has been at certain points in her life. After graduating from college, she lived at home for only a short time and then moved to Georgetown, SC BY HERSELF. She was teaching at an elementary school there, and while it made perfect sense to live in the town where she worked, it was hard for me to accept. Fear of what could happen to this young 23 year old stalked me day and night. I shuddered to think of her going home there alone after work. She didn’t even have any friends there at first, but as the weeks passed, she made friends and adjusted to her job. After tasting independence for a season, Carrie decided it was time to find that special someone. She moved farther away, this time to Charleston. With this move, she had a roommate, and that alleviated some of my anxiety. Still, it was a bigger area with more traffic, more crime, and more uncertainty, and I was a nervous Nellie. I was the one who needed to take lessons from Esther, not Carrie. I’m not sure of the timeline, but I think she’d been there less than two weeks when she met Rich, her future husband. Recently graduated from the University of Utah, he was now an officer in the Navy who had just reported to the Charleston Naval Base. That was over a decade ago. 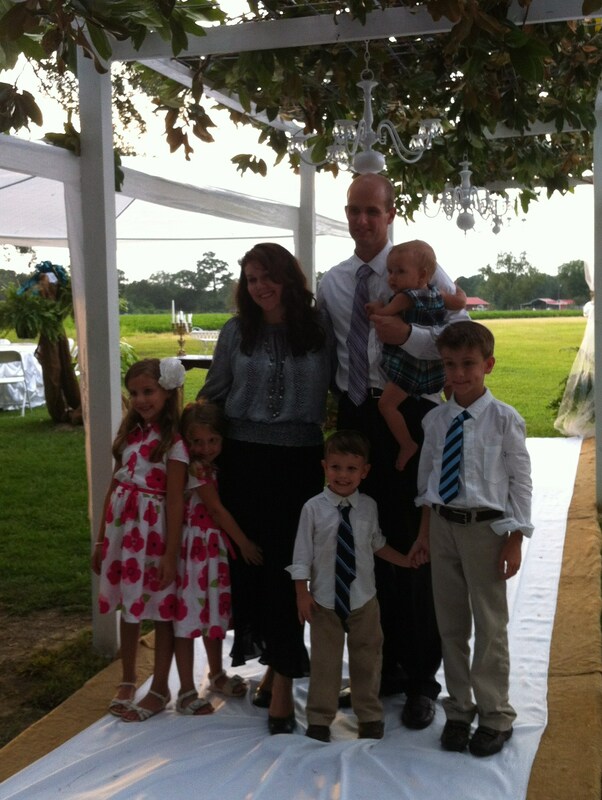 They’re now the busy parents of five active children, and it all happened because Carrie faced the fear and made one of the most important decisions in her life, one that will affect her and her progeny forever. Esther faced the fear. Have you? Will you? Just think about it. You could very well be one brave decision away from the most important turn in your entire life path. Sometimes we have to square our shoulders, hold our heads high and march forward to see the king…or his equivalent. . It could be a life and death situation like Esther’s, a relocation decision like Carrie’s, or something as seemingly small as making a phone call, enrolling in a course, or starting a blog. YOU are in charge of your destiny. What are some choices that you’ve already made that required courage? How did you do it? What were/are some of the ramifications of that decision? This entry was posted in Biblical women, books, fear, writing and tagged books, destiny, facing fear, writing. Bookmark the permalink.